As it is an unusually cold October night, I build up the logs in the fireplace, before Thaila, Teddy, and I settle into the comfy chair. We have a comforter over our legs, which comes up to Teddy’s chin. Thalia has squeezed Teddy between us; from there he stares out, button-eyed. She peruses the table of contents of our book and stabs her finger at the page. “Number 93,” I announce and turn to it. The queen’s infant daughter is giving her mother no peace until the queen exclaims she wishes the child were a raven and would fly away. I remember my beleaguered daughter, Thalia’s mother, during Thalia’s infancy, and empathize with the queen. Thalia was fortunate, but the infant in the story turns into a raven and flies from her mother’s arms. Sometime later a man in a forest hears the raven call to him. The bird wishes him to break her spell, which he can do if he will go to a certain cottage, not eat or drink the food offered to him by the old woman who lives there, then stand on a pile of tanbark in the garden at two o’clock in the afternoon. “What’s tanbark?” Thalia’s eyes narrow. The princess, apparently now in human form, will pass by in a carriage for three consecutive days. If the man can refrain from falling asleep on any one of them, she will be rescued, but she despairs he will be able to do so. He assures her he will, but, of course, the old woman coerces him into taking a sip of wine, causing him to fall asleep. Three times the princess tries to rouse him, and on the third leaves him a loaf of bread, a piece of meat, and a bottle of wine, which are inexhaustible. As a token, she puts a ring on his finger, then leaves a letter telling him he can still rescue her if he comes to the golden castle at Mount Stromberg. He wanders for a long time looking for the golden castle, eventually seeking the aid of a giant, whom he convinces not to eat him with the aid of the inexhaustible feast. After sating his appetite, the giant gets out his maps. When he cannot find Stromberg, he suggests they wait for his brother. The brother, after a long search, finds Stromberg on one of his maps, only to discover it is thousands of miles away. The giant offers to take the man most of the way there, but must return to nurse their child. The man comes to Mount Stromberg to find it is a glass mountain, atop of which sits the golden castle. He can see the princess in her carriage drive by above him, but cannot reach her. He builds a hut at the foot of the mountain and waits. After a year his chance comes when robbers outside his hut are arguing over who should get the magical devices they have stolen: a stick that can open any door, a cloak of invisibility, and a horse that can climb anything, even the glass mountain. He tricks the robbers, takes the stick, cloak, and horse, then drives the scoundrels off. The man now has what he needs to enter the castle, where, wearing the cloak of invisibility, he drops the ring into the princess’s wine glass. The man does not reveal himself right away, but goes back outside and mounts his horse before taking off the cloak. The princess finds him there and promises they will wed the next day. “There are some improbabilities in there,” I say to Thalia. I do too, but I am not sure why a story that does not quite hang together should appeal to me. All in a gesture. This gives me time to sort out my musings. I am into my second bowl of tobacco from the canister on the table labeled “Tom Tildrum”—with a light enough hint of vanilla to be delightful—when Augustus comes in, carrying his black cat in his arms. They install themselves in the other overstuffed chair. “I can tell by the knit of your brow you are puzzled.” Augustus reaches for his pipe. “No single thing, rather a number of little things. I am sure I am going to sound petty, but take the raven talking to the man. That is the last point in the story—and we are still in the beginning—that we see her in her raven form. From that encounter on he is supposed to rescue her from what? From the golden castle? He doesn’t. And how did she get there? Why does becoming a raven put her on the glass mountain in a golden castle? “Mark Twain observed that fiction needs to make sense. Real life is not so encumbered. A detective story, although clues are hidden, needs to make sense in the end. Romance novels, which wallow in lavish and gritty details that culminate in a kiss, need to follow a known pattern. “Fairy tales, like our own lives, are rich in the ‘the unlooked-for.’ Children, such as Thalia, understand fairy tales because, in their young lives, things happen to them without the benefit of experience. Children just assume events are connected. They accept the unlooked-for. His cat closed its eyes and released me from its judgment. I should have gone to bed long ago, but some evenings and their accompanying thoughts render me sleepless. The pipe in my hand, filled with “Tom Tildrurm,” smolders as I stand by my bay window, watching the moon move westward over the enchanted forest. The thought that has kept me awake is the human fascination with our animal side. In The Raven an incautious word from her mother transforms the infant into a raven. Beauty and the Beast may pose the classic dilemma between our human and animal natures. East of the Sun, West of the Moon may be the second-best-known in that motif of the human bride and animal husband. Humans trapped inside of animal bodies are common fare. In the Flounder and the Fisherman the flounder is an enchanted prince. In both the Six Swans and Seven Ravens a sister sacrifices herself to save her enchanted brothers. The Frog King presents us with a pushy reptile with an agenda to reclaim his human form. The Golden Bird has a fox that helps the hero and asks for the reward of having his head and paws chopped off, resulting in a return to his princely form. Another class of human/animal characters is the selkie of Celtic lore, seals that can shed their skins and appear as human. Celtic mermaids are not far behind, being able to give up their fins for legs. Outside of the fairy tale, in less friendly territory, are the werewolves. 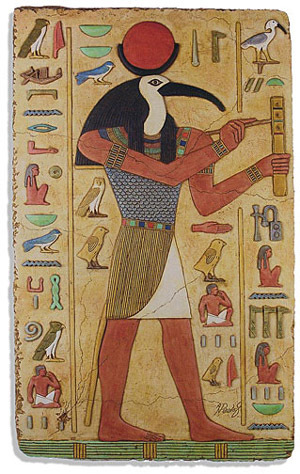 Moving on to mythology, many Egyptian gods were represented as having animal heads: Horus with his hawk head, Thoth with his Ibis head, and the frightening crocodile-headed god Sobek. Interestingly, in the Greek pantheon the animal natures are in the bodies, not the heads. Fauns, centaurs, harpies, all had human facial features. Christianity is not quite devoid of human/animal connections. In the art of stained glass windows, the four apostles have their nonhuman counterparts: Matthew/angel, Mark/lion, Luke/ox, and John/eagle. I will not leave out the Lamb of God. This list could be extended, but what does it say about real or imagined connections to the animal world? It speaks to our fear of animals. Imagine being face to face with a crocodile-headed god. Zeus might be more congenial. Certainly a werewolf in the vicinity is a cause for worry. Selkies and mermaids prompt in us unsettled feelings. As the moon touches the tops of the trees of the forest and I relight my pipe, my thoughts center on the fairy-tale animal transitions, which are different from the mythological divine/animal awe-inspiring presence, or the selkies and mermaids parading as humans, but are akin to the werewolves losing themselves to their animal side. 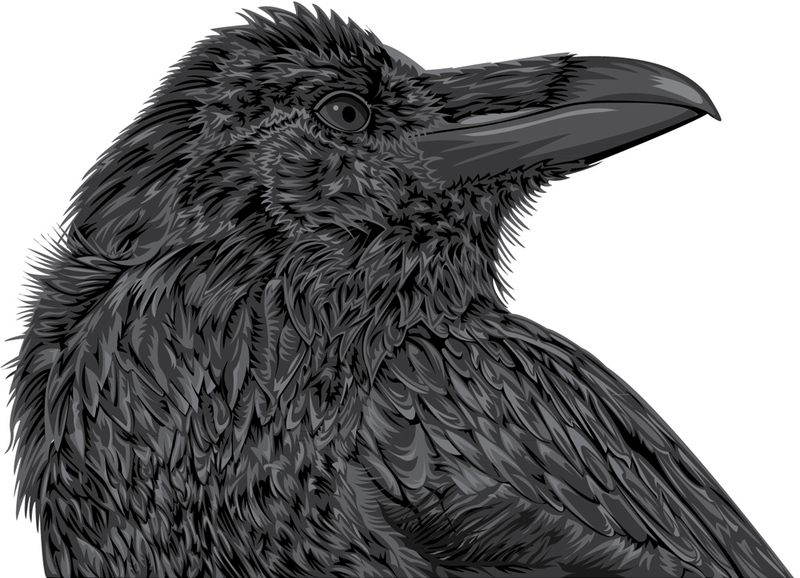 Fairy tales like The Raven—and there are many of them—revolve around a prince or princess who has been cursed and lost their human form. They struggle to overcome the spell. The fairy tale acknowledges that what underlies our fear of animals is the sense that our humanity can easily slip away. A few incautious words, or mean-spirited rhetoric can cast a spell. Once cursed, the fairy tale warns us, it is hard to reclaim our fragile humanity.